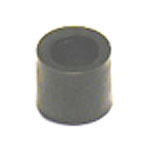 Short black rubber post sleeve used on many Data East games in certain areas on the playfield. Fits at bottom of post, under rubber ring. Made of rigid rubber (replaces earlier versions made of softer rubber). Also replaces # 545-5190-00. Measures 3/8-inch ID 19/32-inch OD 1/2-inch tall.